Organized by: Chris Herzog, Vladimir Korepin and Bruno Nachtergaele. This workshop is organized in connection to the SCGP program on Entanglement and Dynamical Systems. Quantum entanglement is a continuing source of inspiration and progress in physics and mathematics that cuts across traditional boundaries separating different disciplines. 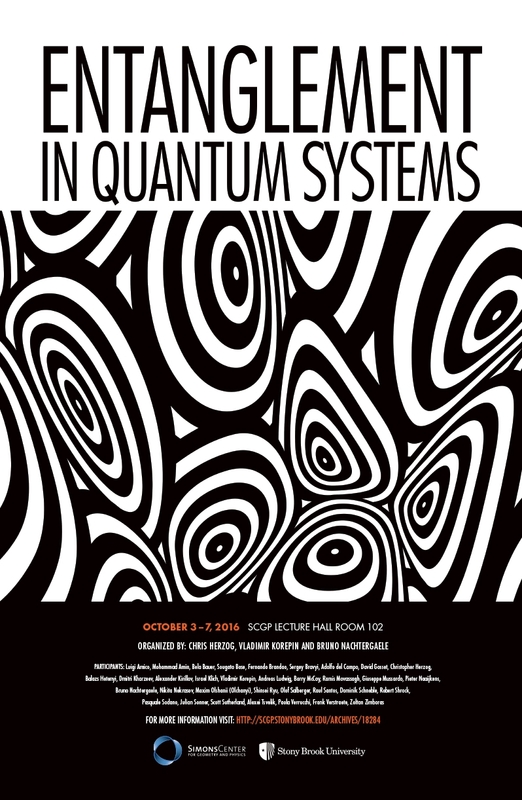 In this workshop, we would like to bring together researchers working statistical physics, high energy physics and entanglement in quantum spin chains. Several of quantum spin chains were experimentally realized [simulation]. Experimentalists consider them as toy models for future quantum devices. Entanglement underlies protocols for quantum teleportation, communication and computation. Spin chains provide good models for the experimental realization of quantum devices such as quantum computers. Near phase transitions entanglement entropy exhibit singularities. The study of entanglement in many-particle systems and its exploitation for implementing specific quantum protocols is an extremely active field of research. It requires a diverse expertise and the use of a variety of computational and theoretical techniques, ranging from combinatorics, density matrix renormalization group and tensor network states to the use of nonperturbative tools of quantum field theory. The study of entanglement in many-particle systems has not only contributed to a better understanding of entanglement measures and witnesses but has also provided new and interesting characterizations of quantum critical systems. Of particular relevance are recent investigations of the scaling of entanglement with distance, entanglement measures and efforts to connect entanglement measures to observables. For spin chains solvable by Bethe Ansatz entanglement can be represented in terms of Fredholm determinants . This helps to study analytical properties of the entropy as a function of physical parameters and to calculate entanglement spectrum. In XY chain ellipses of constant entropy and essential singularity was discovered at multi-critical point . Another spin chain Valence-Bond-Solid also know as Affelck-Lieb-Kennedy-Tasaki plays an important role in quantum computation [measurement based quantum comutation]. The workshop gives to us a unique opportunity to bring these different types of researchers [statistical mechanics , high energy physics and quantum information] together under a single roof. The field is very hot with large numbers of papers coming out daily.